While getting a driver's license is an exciting experience for any teen, traffic accidents are the leading cause of death for people 16 to 19 years old. That's why many states such as Illinois have implemented a Graduated Driver Licensing (GDL) program to combat this alarming statistic. During the GDL process, teens must achieve certain milestones prior to getting their driver's license. In Illinois, the GDL is managed by the Secretary of State (SOS). The first step in the GDL is to get your instruction permit, which is commonly referred to as a learner's permit. If you're new to Illinois and have a learner's permit from your previous state, your permit may transfer to Illinois, but it depends on your out-of-state driving experience and driver's education requirements. To find out if you meet the GDL requirements for Illinois, you can contact the SOS at (888) 261-5238. Illinois has established age-related requirements for obtaining an instruction permit . Be currently enrolled in a state-approved driver's education course. Provide proof that you're a maximum of 30 days away from beginning a driver's education course. Your Driver's Ed course must include 30 hours of classroom instruction as well as 6 hours of behind-the-wheel instruction. Driver's Ed can be taken either at a high school or from a certified provider. Online Driver's Ed is not approved for Illinois at this time. For more information regarding driver's education, please refer to our Driver's Education page. If you are 17 years and 3 months old or older, you may apply for a learner's permit without taking Driver's Ed. Proof of identity/date of birth (original birth certificate, adoption records, certified high school/grade school transcript). Proof of Social Security (Social Security card, award letter, Illinois ID card record). 1 document proving residency (bank statement, report card, letter on school stationery). Proof of enrollment in Driver's Ed. For more information, please refer to this list of acceptable document requirements. Once you have submitted the required documents, you're ready to take the written permit test/knowledge exam. The exam is composed of questions regarding traffic sign identification and road rules featured in the Rules of the Road Review Course Workbook. Successfully pass the written permit test. If you're under 18 years old, your permit is valid for 2 years and you must hold it a minimum of 9 months before you can apply for an initial driver's license. If you're 18 years old or older, you'll receive an Illinois learner's permit that is valid for only 1 year. As mentioned above, studying the driver manual is a good way to prepare, but we have an even better suggestion. Try an online practice test from our approved partner. This is a great way to ensure passing the written test on your first attempt. Need to get a Learner's Permit? Let's click through the process. How old are you? Are you enrolled in Driver’s Ed? Awesome! You’ll be ready to get your permit at age 15—but you’ll have to wait until then to apply. In the meantime, you can practice for your written permit exam. If you enroll now, you can apply for your permit at age 15. Great! You’ll need to take the written permit test. Are you prepared? Are you taking Driver’s Ed within the next 30 days? You must be already enrolled or within 30 days of enrollment in Driver’s Ed to get your permit. Enroll today! Nice! You’ll need to take the written permit test. Are you prepared? Great! Have you completed driver’s ed? Okay, great! You don’t need a learner’s permit—you’re ready to apply for your driver’s license. Please follow these steps to get started! Since you’re not yet 21 years old, you don’t need a permit, but you DO need to take an adult Driver’s Ed course before you can get your Illinois driver’s license. Before you take your written test we recommend taking a Practice Test. Purchasing a Illinois practice test to prepare and teach you what you need to know to successfully pass your written exam. Before you take your written test we recommend studying a DMV Cheatsheet. Computer, tablet, or mobile phone. 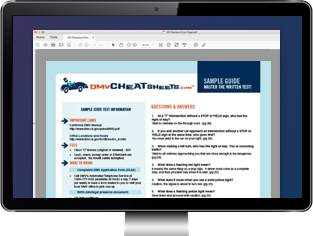 Purchase a DMV Written Test Cheat Sheet ► Powered by DMV Cheat Sheets. As part of the GDL requirements, you'll need to complete 50 hours of supervised practice driving with 10 hours driven at night. During this time, you must always be accompanied by a driver who is at least 21 years old and has a driver's license for the type of vehicle you are in. With 1 passenger in your front seat, and only as many passengers in the back seat as there are seat belts. With your learner's permit in your possession. Failure to carry it will result in losing your eligibility for a driver's license until you are 18 years old. While using a cell phone at any time, unless you are in an emergency or need to report one. You are also never allowed to text and drive in any situation. * NOTE: These are state-imposed restrictions. Your local curfews may vary. Please follow local curfew hours unless otherwise directed by law enforcement. If you need to replace your instruction permit, you must apply in person at a local driver services office. Bring the documents mentioned above, along with $5 for the learner's permit replacement fee. If your permit was stolen, or you are a dependent of an active duty Armed Forces member, this fee can be waived. For more information, please refer to our page on replacing a lost license or permit in Illinois. With your Illinois learner's permit in your possession, it's time to start honing your driving skills. While you're on the road, it's vital to be aware of your surroundings at all times. Your next step in the GDL process is to get your initial driver's license, for more information please refer to our IL Teen Driver's License page.